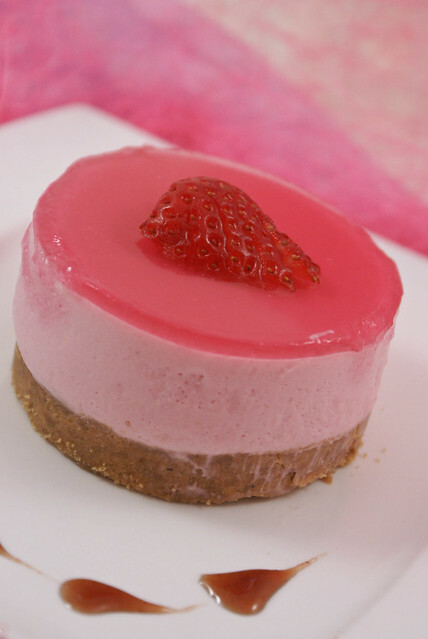 Last weekend I found some fresh and ripe strawberries at the groceries.. and I just knew what I wanted to do with them – a no bake strawberry cheesecake. I wanted to make a no bake cheese cake from long time.. and here you go. White granulated Sugar : 5 Tbsp, you can increase if you want more sweetness to the cake. Add in Biscuits and Sugar in a processor till fine. Mix in melted butter and press into an 8 inch round springform pan, or like me if you want to serve individual portions use a mini cheesecake forms. Chill in refrigerator for half an hour. Soak gelatin leaves in cold water for 5 min till soft. Remove and squeeze and add into 2 to 3 Tbsp hot water and stir till melted. Pulse strawberries in a processor to get a smooth pulp. 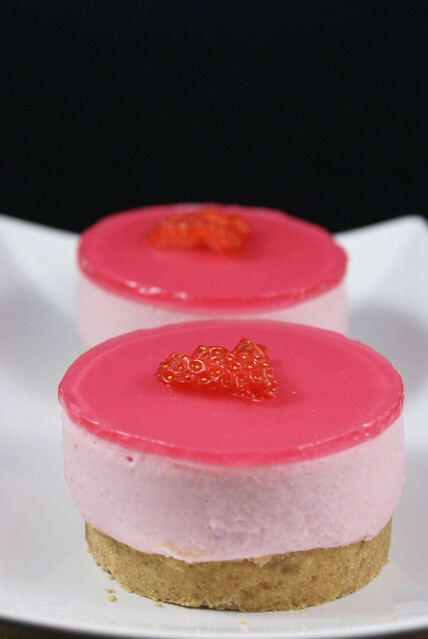 With the help of a stand mixer or a hand mixer, whisk mascarpone, strawberry pulp and sugar till smooth. Add gelatin and whisk again. Whip cream till it forms soft peaks. Fold the cream into the mascarpone-strawberry mixture. Take out the springform from the fridge and pour in the mixture. Return the pan back into the refrigerator and allow it to set for about 3 to 4 hours. For the Strawberry gelee, puree the strawberries and run the puree thru a strainer to get clear pulp. Soak gelatin leaves in cold water for few minutes, squeeze and dissolve in 2 – 3 Tbsp hot water. 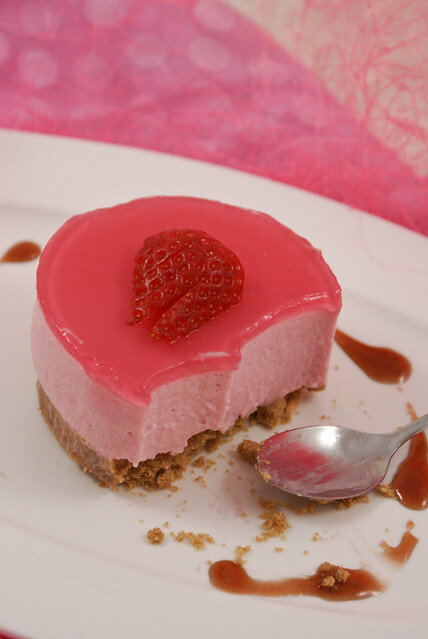 Mix in gelatin, lime juice and sugar into the strawberry puree. 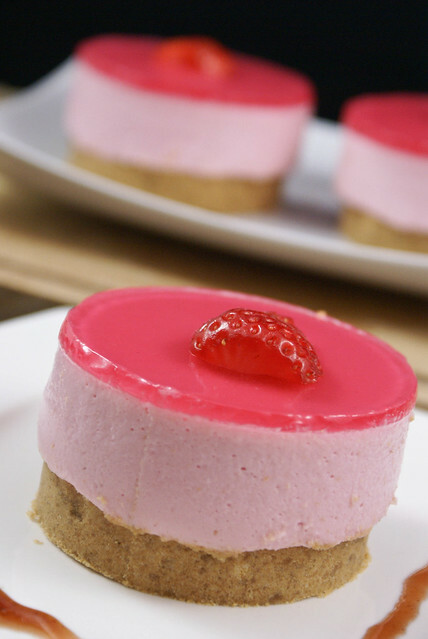 After the cheesecake is set for about 1 hour, take the pan out and pour the strawberry gelee, and put the pan back into the fridge. Wow, perfectly set cheese cake! loved it, and beautiful pics! Very delicious colorful cake. Yummyyyyy. 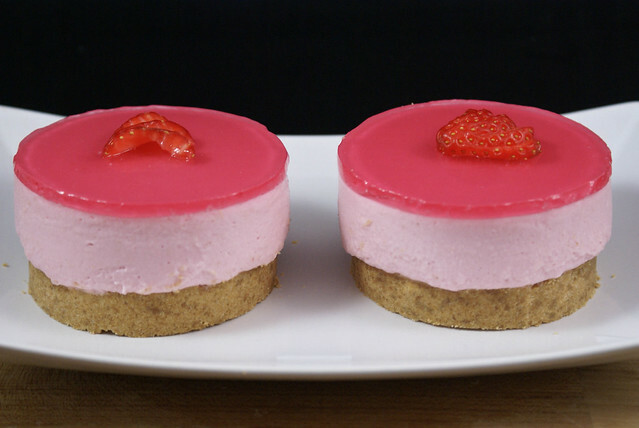 these look simply beautiful!………awesome cheesecake..and that jelly on top……mastercheffy! Thank Simran, I am glad you liked it! Very beautifully made and clicked. Lovely colors and good presentation! Hi Spandana, Where do we get Mascarpone and whipping cream in hyderabad? Where do u buy all these ingredients. I want to try this…. Hi Sameera, I sent you mail. And I hope that information helps.